With the release of Star Wars: The Last Jedi upon us, fans are turning back to the original Star Wars trilogy in preparation. What is it about Star Wars that makes it such a force to be reckoned with? But while ideas are what hold a film together at its core, the design techniques used to deliver those ideas have a profound effect on viewer experience. When Star Wars (later retitled Star Wars Episode IV: A New Hope) first hit theatres in 1977, it broke box office records, grossing $220 million during its initial theatrical run ($859 million with inflation). People flocked to theatres to see the visually stunning film. Critics compared it to 2001: A Space Odyssey in terms of its groundbreaking special effects. That being said, the flashy special effects aren’t the only reason why the film was so successful. Undeniably, what has made A New Hope and its two sequels stand the test of time are its effortlessly fun and engaging story. What facilitates a timeless visual story? Some very basic principles of design. A good film should not only dazzle viewers with its effects, but should also facilitate the storytelling through its seamless design and editing. The same goes for static visual storytelling, like in print design and infographics. In honor of Star Wars: The Last Jedi, we went back to the original Star Wars trilogy to take a closer look at how the films employed fundamental principles of design to tell some of film history’s most beloved stories. These days, almost every high profile movie is released in 3D. But even in traditional 2D film, scenes don’t appear flat. That’s because the placement of objects on the visual plane create the illusion of space between the background, midground and foreground of the scene. The two robotic frenemies appear to be closer to the viewer, while the wrecked spaceship is off in the distance behind them. 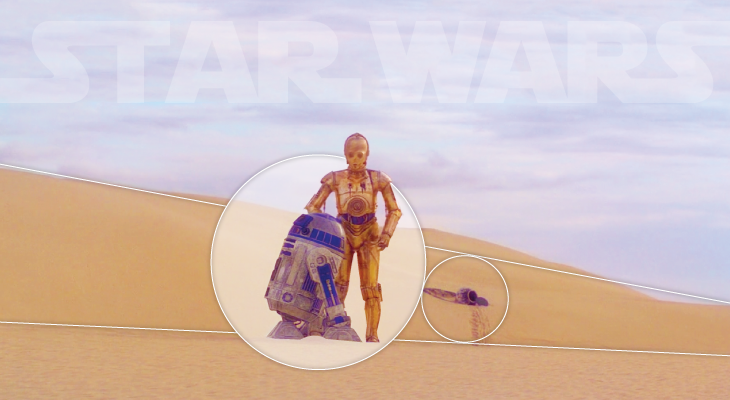 If you divide the scene into three sections, you can see that the illusion of distance is created by placing C-3PO and R2-D2 in greater focus in the foreground, their appearance rendered three-dimensional by the use of light and shadow, giving their bodies a rounded look. Meanwhile the ship appears more flat and unfocused in the background. The illusion is made more natural by overlapping elements across the foreground, midground and background, creating the effect of looking head-on at the two characters and then beyond them to the ship. Contrast is achieved by placing opposing visual elements side by side. The juxtaposition between the two elements, particularly two objects of opposing sizes, can create a daunting mood or a mood of wonderment and sublimity. The Star Wars films are full of scenes that juxtapose massive ships to smaller ones. In this scene from Return of the Jedi, our band of heroes are placed in a small transport next to Jabba the Hutt’s much larger ship. The placement of both ships beside each other emphasizes the dominance of Jabba the Hutt’s ship. This creates an uneasy mood, as Luke Skywalker and Han Solo appear to be outmatched. That being said, by contrasting both ships, the viewer’s attention is drawn to the smaller ship because of the tension created by its proximity to the larger. While Jabba the Hutt’s ship takes up most of the left side of the shot, Luke and Han’s smaller ship stands out against the background, drawing the viewer’s focus. Negative space is the space around a defining object. Similar to how a larger object contrasted with a smaller object will bring the smaller object into focus, using negative space draws attention to the focal point in its center, lending to the drama and tension in a scene. Negative space also allows for visual pause between objects, making them easier for viewers to process. If you want the viewer’s eye to focus on a particular object, it needs to have enough negative space around it to prevent them from being distracted. Grouping many objects closely together makes it difficult to distinguish them from one another (an effect that you would want to achieve if all of the objects are part of a unified whole). In this scene of C-3PO standing alone on Tatooine in A New Hope, the negative space of the desert around him brings his solitary figure into greater focus. This establishes C-3PO as the focal point in the shot and emphasizes his solitude on the unknown planet. Perspective creates dynamic and visually interesting compositions, allowing certain objects to become more dominant depending on where they are placed. Lines are used to direct perspective, whether it’s a one-point or two-point perspective. The straight lines of the reactor core point downward in an arrow shape, creating the perspective of looking down. The effect is enhanced by the use of light that draws the viewer’s eye to the focal point of the shot, at the base of the core. Depth plays into perspective as well, as the size and placement of objects in the background, midground and foreground contribute to the illusion of perspective. Symmetry balances a design and highlights its focal object. You can create symmetry by mirroring design elements on each side of the composition and by placing focal objects in the middle of the composition. Luke Skywalker, Han Solo and Chewbacca are flanked on both sides by identical rows of soldiers. They walk down a straight path directly in the middle of the shot, with straight lines pointing to the stage in the background. The symmetry and balance in the scene feels formal, satisfying and conclusive. This is similar to perspective, but refers more specifically to the elements that direct the viewer’s gaze. Directional cues direct the eye’s navigation through visual elements, towards the focal object. The most straightforward directional cues are objects placed in the direction you want the viewer’s eyes to go, or lines or arrows pointing the viewer’s attention towards a focal object. In this scene from The Empire Strikes Back, the lines and lights in the ship’s hallway direct the viewer’s eyes towards Luke Skywalker. This establishes Luke Skywalker as the focal object. Repetition emphasizes an idea through the use of repeated visual elements, forming strength and unity between objects. Design repetition is achieved by repeating elements using patterns, lines and colors, or by repeat elements in close proximity to one another so they appear to belong to the same group. In this scene from Return of the Jedi, the stormtroopers are lined up in rows that create the effect of them being one unified entity, emphasizing their sheer numbers. This contrasts the stormtroopers with the figures moving down the path. Whether your design is 3D or flat, these basic design principles used in the original Star Wars trilogy are tried and true. When your design is seamless and effective, the ideas that make them timeless can come through. We can’t wait to see what exciting design elements are in store in The Last Jedi! The infographic in this article was created by Steve Shearer.